Living longer, stronger, healthier lives. Join the fellowship & fun! The non-profit corporation exists to organize and conduct a program of aid and service for the senior citizens of Western Kenosha County, Wisconsin. These purposes shall be effected through the creation and operation of a senior citizen center. We cherish the past, live fully in the present and embrace the future through optimism, innovation and passion. Your tax-free donation helps us grow senior activities for special events, classes and wellness. 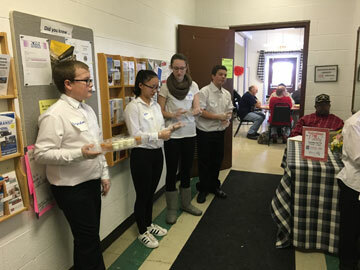 Volunteers from Bristol Elementary line up to serve a Valentine luncheon. The event also celebrated WSCC volunteers. We host KAFASI's Senior Dining daily at noon. Call 1-262-358-5554 by 10 a.m. day before for reservations. Click here to see April's menu. Note that on Thursdays a fabulous soup/ salad/ sandwich bar is served here, not the meal shown on the menu.